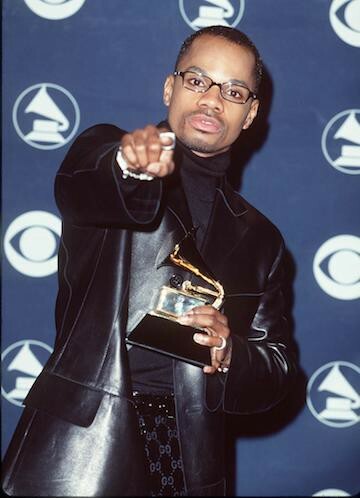 Kirk Franklin is the Minister of Music for the hip-hop generation (and the best hype man across any genre with the exception of Spliff Star). His music was groundbreaking — and sometimes scandalous — and changed the relationship between gospel and secular music forever. For Vibe, I wrote about how Kirk Franklin changed gospel music (and the gospel music business). But I also want to go through some of his best bops. The biggest reason Kirk was so revolutionary was his hip-hop approach to production. He sampled everything from ‘80s pop to ‘90s hip-hop hits in Jesus’ name, and floated over the tracks with ad libs on par with only one other combo producer/hype man/front man. He’s the gospel Puffy. But before we get into all that, we’ll still start at the beginning. Before Kirk was ad libbin’ all over tracks for the Holy Ghost, he was solidly in the contemporary gospel pocket. He made his name directing some of gospel’s prominant choir’s, like the Georgia Mass Choir. Very very rare instance for Kirk singing lead. “Why We Sing” was a traditional contemporary gospel song, but was still an update on a classic, making is accessible to a younger and broader audience. It was not only a massive gospel and contemporary Christian hit, it was an R&B hit. How live did you get when you got to sing “Melodies From Heaven” in the youth choir because you knew the “Anniversary” sample was coming and it made you feel like ya’ll were getting away with something? I know you know your part. Go ‘head and sing. WHOOOOO sits down and says “You know what would be really fire under this song about the Holy Spirit raining down on us? Junior Mafia”? Lots of young music ministers in the ‘90s (and now, and I imagine always) struggled with balancing their love of secular music with their calling to gospel. Andraè Crouch opened a door to adding a contemporary R&B feel, but Kirk went further than that. With God’s Property (and a production deal with Interscope), Kirk really leaned into breaking the gospel sonic barriers…to mixed reaction. But for some folks, gospel with Funkadelic samples and rap features (even a saved rapper)…too much. Kirk’s argument has always been that gospel is not a sound, it’s a message. And he was delivering the good news in familiar packaging. …Or collaborations with secular producers like Darkchild (who also happens to be a PK) and full Hype-Williams-esque videos. Also, this is one of my favorite videos in life. Now, Kirk is also guilty of not so much sampling as just changing lyrics. But some of his flips were unexpected. Obviously though, Kirk is the biggest gospel artist of his generation bc he also does straight contemporary gospel so well. Crazy w/ pen game and arrangements (he was directing the adult choir at 11 years old). Every former youth or YA choir member knows some Kirk. SANG TAMELA. Kirk be with you in the club (at a Holy Ghost party, of course) on Saturday night, and kickin’ it with your Nana on Bobby Jones Gospel on Sunday. And that’s not easy. At all. …is 180 degrees from this song. And it’s kinda sample inception, cause it all comes from this song. Here’s the rub, though — as much as Kirk deserves credit for making gospel music more accessible to a wider audience (and increasing the revenue threshold for gospel artists; he was the first gospel act to go platinum), he’s also part of gospel’s shift to a simpler praise-and-worship style. That’s a whole other convo, though. Let’s thank him for making gospel fun, for letting us know worship can take many forms, and for giving us a new generation of gospel that felt like our own.